Now in its 46th year, the Ancient Order of Hibernians have presented Nassau County with its annual Irish Feis and Festival. Held every year in September the Feis is a celebration of Irish culture and history. This year, the Feis will be held on Sept. 16th at Nickerson Beach, Lido Beach NY with its traditional dance and piping competitions, along with an Irish Marketplace and a special area for children. Since it’s a Sunday, a mass will be be held at 11:00 AM in the morning. But, the day centers around Irish traditions. The dance competition may be the premiere “outdoor” Feis in the New York Metro Area, while pipers from all around come to perform. Having a family member selected as an Aide to the Grand Marshal of the New York City St. Patrick’s Day Parade has traditionally been a once-in-a-lifetime event. But an Island Park, N.Y. couple has switched up tradition: Regina Begley was the 2016 Nassau County Aide to the Grand Marshal and this year, her husband, Peter, is wearing the ceremonial Aide’s sash representing Nassau County in the march up Fifth Avenue. Back-to-back wife-and-husband Aides to the Grand Marshal is a first for the 256-year-old Parade, the world’s oldest and largest St. Patrick’s Day Parade, which steps off on Friday, March 17. “Regina and Peter Begley represent the finest traditions of Irish-American woman and men who dedicate themselves to promoting the values of St. Patrick which the Hibernians and the St. Patrick’s Day Parade recognize,” said John L. Lahey, Chairman & CEO of the New York City St. Patrick’s Day Parade Board of Directors. When Peter Begley met Regina McGannon in Long Beach, N.Y. in 1997, each was a member of The Ancient Order of Hibernians, an Irish cultural organization whose members are known as “Hibernians.” Soon, Regina said, “most of our free time became Hibernian time.” Each became officers on their Nassau County executive boards: Regina on the Ladies Ancient Order of Hibernians and Peter on the Ancient Order of Hibernians. Regina currently serves on the New York State board of the Ladies AOH, and is the current LAOH Nassau County President. Peter is the current President of the Nassau County Firefighters Emerald Society. He is also a”Life Member” of the Island Park Volunteer Fire Department serving over 26 years and is a Former Captain of the Original Engine Company #1. The couple also attends AOH social events throughout New York state and are regulars on the Hibernian social circuit of Communion breakfasts, Christmas dances and county balls. And, there’s “marching season” as the month of March is called by die-hard parade goers. 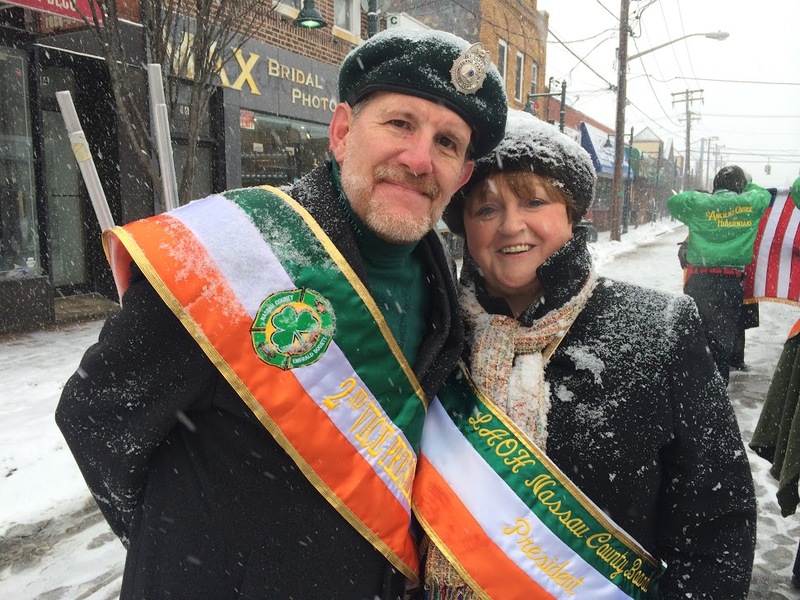 In addition to the New York City St. Patrick’s Day Parade, the Begleys also march in the local St. Patrick’s Day parades held on weekends in Mineola, Rockville Centre, and Glen Cove on Long Island. In 2016, the Hibernians selected both Regina and Peter as the Aides to the Grand Marshal for the Glen Cove Parade. The next County Board Meeting will take place on Wednesday September 6, 2017 at 8:00 pm at Hibernian Hall in Massapequa. Congratulations to our own County President and LAOH NYS Historian Regina McGannon Begley, who has been named as this year’s Nassau County Aide to the Grand Marshal of the NYC Saint Patrick’s Day Parade. 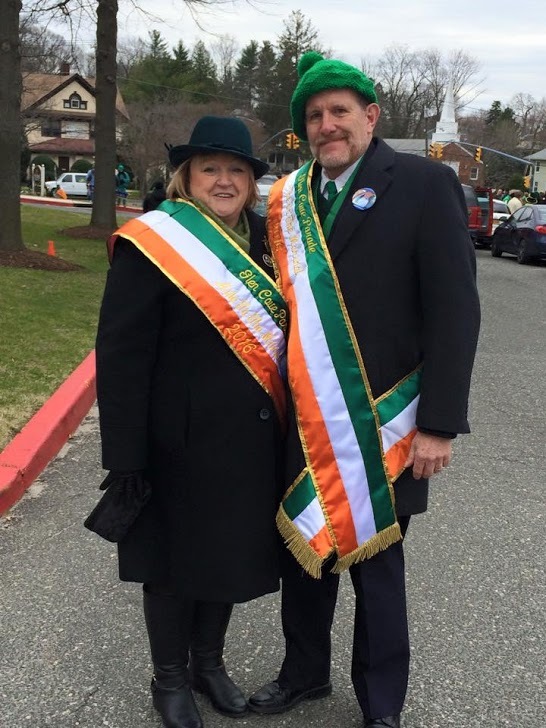 Regina, along with her husband Peter (AOH Nassau County Vice President), have been named Aides to the Grand Marshal (Paul Long) in the 2016 Glen Cove Saint Patrick’s Parade to be held on Sunday March 21st. Over the next few months we will be adding online registrations and also schedules and sylibuses for the upcoming competition, but as of right now, feel free to take a look at video and photos from last year’s Feis. The site is at www.nassauaohfeis.com.